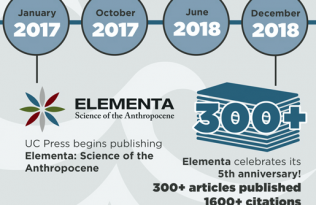 Alastair Iles is Editor-in-Chief, along with Anne Kapuscinski, of the Sustainability Transitions domain of UC Press’s open-access journal Elementa: Science of the Anthropocene. UC Press: Elementa has published extensively on food and agriculture, including collections of articles clustered around sustainability in agroecological systems, food-energy-water systems (FEWS), and a new bilingual Forum on Cuba’s transitioning agrifood system. What makes food and agriculture so central to discussions about the effects and mitigation of climate change? 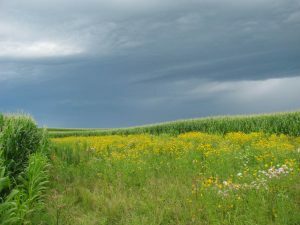 Science-based Trials of Rowcrops Integrated with Prairie Strips (STRIPS) experiment at the Neal Smith National Wildlife Refuge, Iowa. Image credit: Anna MacDonald. Alastair Iles: Food and agriculture is one of our strengths as a journal, along with climate change, atmospheric science, and environmental science. That we’ve been publishing so many articles on food systems speaks much to the level of research interest in this arena. Globally, agriculture is one of the largest contributors to greenhouse gas emissions, partly because of its land use change consequences in countries from Brazil to Indonesia. Livestock also contribute directly to emissions, particularly in the US. Moreover, climate change is set to affect agriculture almost everywhere. Drought is afflicting many agricultural regions from California to my native Australia. Growing numbers of extreme events like heat waves and floods also undermine crop yields, as well as hurt farmers and rural communities. On the mitigation side, sequestering carbon in soils could be a very important way to expand a large carbon sink. Finding policies to stimulate farmers to adopt soil health practices in California is something that I research. But we shouldn’t just think about climate change—we also need to be thinking about the range of environmental and social impacts of industrial agriculture. Just in the past year, we’ve learned about a dramatic plunge in insect numbers in and around agricultural areas in Europe that is being attributed to the long-term use of pesticides. And if we are to increase sustainable agriculture in developed countries, we need to find new farmers and enable them to survive in a harsh industrial system. UC Press: Elementa’s most-discussed article has got to be “Carrying capacity of U.S. agricultural land: Ten diet scenarios,” by Christian Peters et al. What do you think it was that struck the public’s imagination here? Alastair Iles: Everyone wants to know how each of us can help mitigate climate change in practical ways. One of the most immediate steps we can take is to change our daily diet toward foods and farming methods that are associated with substantially lower greenhouse gas emissions. But what diets might be better in this sense? And what sort of US agricultural system would a low-carbon diet require? Christian Peters and his team connected agriculture and nutrition together in their modeling of different dietary scenarios. In the past, most scientific studies have tended to keep these apart. But we can’t separate food consumption and production because these are shaping each other. One conclusion was that plant-based diets (with less meat) are more likely to have smaller environmental and climate footprints. Another was that existing uses of agricultural land would need to favor vegetables, pulses, and fruits more than feed grains and pasture to achieve this outcome. This article is a good example of the innovative research Elementa aims to publish. UC Press: One of the unique aspects of Elementa—which is especially true of the Sustainability Transitions domain—is the transdisciplinary conversation it invites: social scientists dialoguing with natural scientists, practitioners and policymakers weighing in alongside research scientists, etc. Why is it important for Elementa to break down barriers to knowledge between diverse fields? Alastair Iles: One reason why I originally joined Elementa as an editor is because I loved the transdisciplinary conversation it is helping catalyze. We offer a variety of article formats, including commentaries and policy briefs, that allow practitioners and policy-makers to contribute their experiences. In the area of food and agriculture research, there have been deep disciplinary divisions between ecologists and sociologists, between agronomists and policy-makers, and between many other groups. Historically, in the US at least, practitioners, scientists, and farming communities worked together in cooperative extension programs. But this tradition has been lost as industrial agriculture has come to predominate and as universities have moved more into molecular biology. As a result, many disconnections exist between parts of the food system that are impeding creative solutions. A few years ago, I helped found the Berkeley Food Institute that sought to overcome these barriers at UC Berkeley. It’s a work in progress. It has helped me see that the sustainability transitions domain can be a special place for continuing this work but on a larger platform. UC Press: How does the Sustainability Transitions domain make the journal different from many other journals publishing on sustainability or socio-ecological issues? Alastair Iles: One of the most exciting parts of my job as a new editor is to help continue to nurture innovative thinking about transitions to sustainable societies. 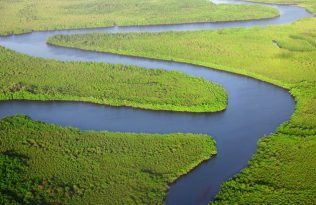 We already know a lot about what might enable greater sustainability in areas from water to energy. We have a range of technologies in use or development; we also have potential practices such as water conserving behavior. But how can we work toward building a world that widely adopts these? And how can we escape from the deep technological and institutional lock-ins that impede this—like the dominance of fossil fuels? Here, the sustainability transitions field has been starting to do some important work. The reason why we have this domain is to promote new dialogue in all disciplinary fields about the processes, politics, and practices of actually making large-scale, systemic change in our current economies and societies. We define transitions research very broadly—as anything that can contribute to this larger goal. UC Press: What’s in store for the journal in the short- to mid-term? What are you hoping to accomplish at the American Association of Geographers’ annual meeting in your role as Elementa Editor-in-Chief? Alastair Iles: After our first five years, we’re taking stock of what we’ve learned as a newish journal. We’re expanding our group of associate editors for the sustainability transitions domain to better capture the rich diversity of papers we are now receiving. Open access publishing is much more credible now, especially with the University of California’s recent decision to walk away from Elsevier in negotiating ever-more costly access to its closed-journals. Having seen the great success of the agroecology forums we have hosted, we want to nurture more special features that speak to the greatest challenges of our times. For example, what can we learn from how societies have managed climate change in the past for our future? And what are the implications of CRISPR-Cas9 for agriculture and food? At AAG, I’m hoping to meet some potential authors who are interested in publishing with us. Many AAG sessions could potentially be the basis of great special features. Please do stop by the UC Press table in the exhibitor hall to learn more about us. Or, visit our journal website. 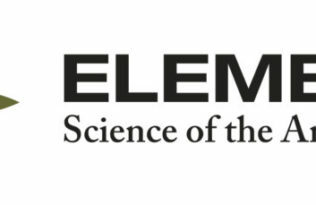 Elementa: Science of the Anthropocene is a trans-disciplinary, open-access journal committed to the facilitation of collaborative, peer-reviewed research. With the ultimate objective of accelerating scientific solutions to the challenges presented by this era of human impact, Elementa is uniquely structured into five knowledge domains, and gives authors the opportunity to publish in one or multiple domains, helping them to present their research and commentary to interested readers from disciplines related to their own.